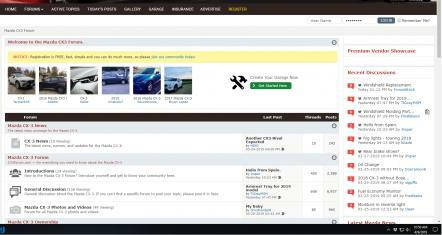 Mazda CX3 Forum > Forum Information & Help > CX3forum.com Forum Information & Help > website bug? Something I noticed a while back but thought I was overtired or assumed it was due to vpn or something. 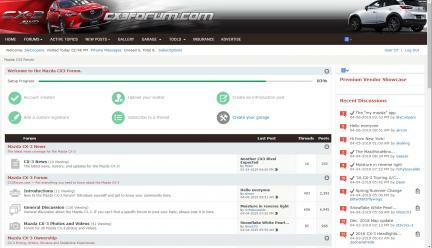 The main forum page https://www.cx3forum.com/forum seems to have a time issue on the recent discussion sidebar. When not logged in it defaults to 9days ago showing recent discussions as it would be from 3/29 (this changes per day I assume now that I am noticing it more thoroughly). Opening the most recent post from the not-logged-in version shows the post but viewed from the current date. 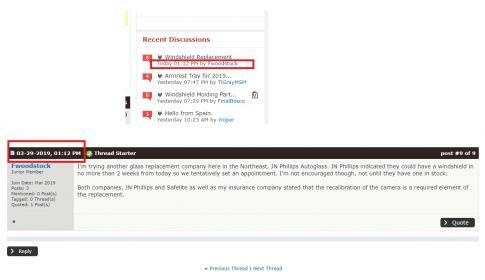 So in the picture, the windshield replacement thread sidebar is 'today' but the post is actually from 3/29/2019. 2016 CX-3 GT AWD - Crystal White Pearl Mica. I noticed this a couple of weeks ago now when just viewing the site without being logged on. When I am logged into my account it is working fine. This is by design. We added a feature called CloudFlare which creates a cached version of the site and served that to non-signed in users and guests. This has 2 main goals. First, improved speed for our signed in users, since the servers won't be sending live, up-to-date data to every guests on the site. Second, increased security as any outside attack trying to get into the site will be trying to get into a cached version that has no information. The cached version of the site refresh on a schedule, which differs depending on what level of the site you are on. I'm not sure how quickly the index pages refresh, but if you go to the thread level it should be refreshing every 5 mins. SlyCoopers and Stokers Rule like this. CX3Forum.com - The Biggest Mazda CX-3 Forum! That makes sense it was just confusing why it was only effecting that one specific page link when other paths in the domain were almost live synced. Although in the last few days the not-signed-in cache has gotten a little more delayed site-wide. Not sure if its an issue or not but now some threads are showing only content from last sync which was a few days ago. For example the factor I mentioned above is now almost sitewide instead of just the index page, including individual thread level. In the offroad-y tires thread I couldnt see the last post in the actual thead there by richyboycaldo until I signed in and its a couple of days old now. Not trying to complain, it just seems like accessing days old (potentially week+) pages seems to alienate any new current posts/threads that someone would otherwise not see unless logged in. Even then the updated re-sync for the not-signed-in version may completely push those previously undiscovered posts further down the recent discussions queue that it does not show up and probably noone will see it unless manually looking through the threads, or was signed in everytime they view the site. Maybe the syncing interval is off from original intention? I might just be a rare occurance lol so dont mind my experience too much. Usually I check multiple times a day quickly without signing in (especially if im in a place like work where I should not be signing in or checking). Theres bound to be a few others who check occasionally to see if anything new has popped up without signing in who are probably equally confused. Last edited by SlyCoopers; Yesterday at 12:21 AM. I'll send this back up and see if we can get further clarification on it. As I see it, when I am not logged into my account it is only on the https://www.cx3forum.com/forum/ page that the Recent Discussions area is out of date. All the other areas / sections are showing the latest postings. If the Recent Discussions section was just blanked out for guest visitors - with perhaps some text saying something like "This section is available to forum members only, click Register in top line to become a member" it would solve the confusion currently caused as well as encouraging guests to register as members?